For genuine European cheeses, sausages, and wines, Chateau Hestia Garden Restaurant & Deli in Silang Town, Cavite Province, stands out. Foreigners, local tourists, celebrities, and politicians drive all the way to Silang to have a taste of Europe. 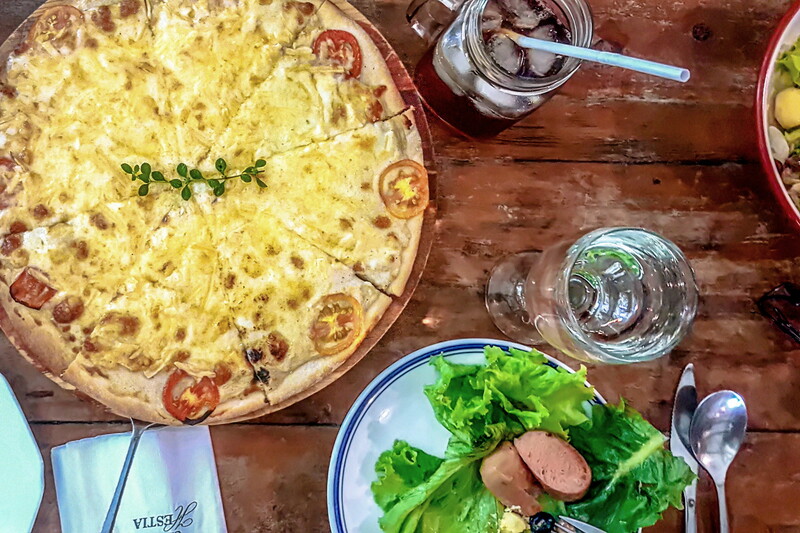 My family and I instantly experienced a gastronomical European tour with all the authentic dishes originating from Austria, Germany, Italy, Switzerland and France in this comfy and rustic restaurant. While you wait for your order, you can already enjoy their complimentary bread platter with eggplant dip. Bring in the meats. Presenting the entrées. Ending on a sweet note. Desserts. Gongonzola Cheesecake Php210. I’m a fan of cheesecakes and this one is amazing. There’s a hint of that distinct gorgonzola taste, but not too strong, which makes it light and perfect. Chocolate Chiffon Cake Php125. It’s dreamy. Rich dark chocolate that can put me in a trance. Delicious. They have a shop where you can buy authentic sausages and even homemade wines. To spend the night, you can also enjoy their bed and breakfast, click here. Chateau Hestia Garden Restaurant & Deli opened in 2007, serving their very own home recipes using the traditional slow-cooking process. They use meats from grass-fed cows, locally grown herbs and vegetables and fine-quality ingredients from all over Europe. They bake their own breads, make their own dips and salad dressings without extenders and emulsifiers. Chateau refers to a large French country house. Hestia is the Greek goddess of hearth. Hearth is the area in front of the fireplace. Chateau Hestia.